The U.S. Capitol is one of the most popular tourist destinations in Washington, D.C. 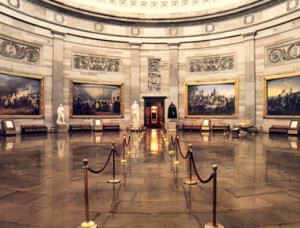 In this Travel Post I will discuss the history of the building and give a brief description of the various interior areas, such as the Rotunda where several Presidents have laid in state prior to their funerals, the Crypt which was originally instead as the burial site of the first President George Washington and the National Statuary Hall which holds numerous statues of prominent Americans. 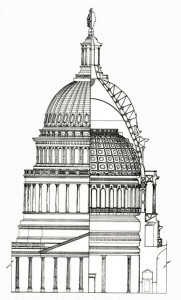 To end this post, there is some fun trivia about the U.S. Capitol building. 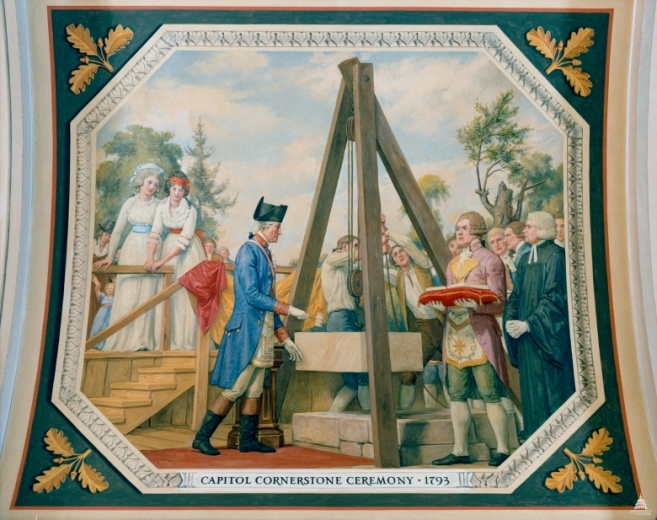 On September 18, 1793 the U.S. Capitol cornerstone was laid by President George Washington in an elaborate ceremony, a special commemorative metal plate also buried according to masonic traditions. The festivities also included a parade, marching bands speeches and a pig barbecue for all those in attendance. 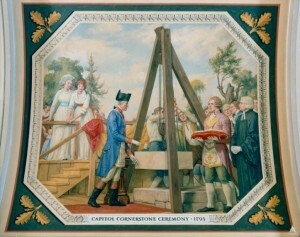 Special Notes: In the Cox Corridors of the House Wing of the U.S. Capitol Building there is a mural depicting the cornerstone laying ceremony, as shown in the photo above. 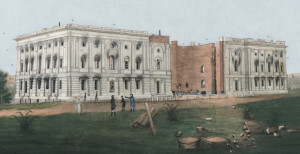 The north wing of the Capitol was completed and the first session of Congress was held in the new building on November 17, 1800. By 1803, construction on the south wing was started under the direction of Benjamin Henry Latrobe and when it was completed in 1813 a temporary wooden covered walkway connected the two wings. Then during the War of 1812, on August 24, 1814 British troops entered the city and set fire to many of the buildings of Washington, D.C. including the White House and the U.S. Capitol, luckily a sudden rainstorm prevented the city from being completely destroyed. 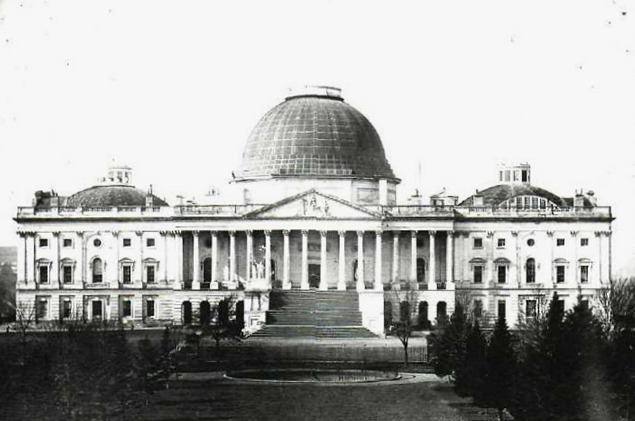 Repairs on the Capitol after the war ended and the anticipated plan was to join the two separate wings of the building with a domed center section in an architectural style that would be cohesive. Special Note: Held within the Capitol building was the small library which was for the special use of the members of U.S. Congress and the Supreme Court. 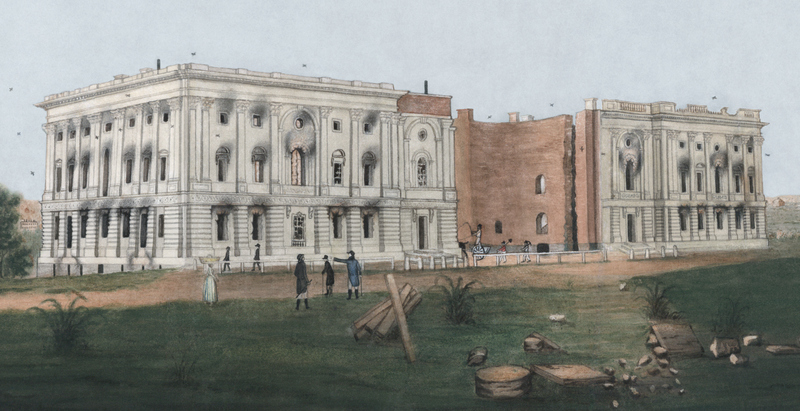 In 1802, President Jefferson signed legislation to establish a permanent building for the Library of Congress. Unfortunately, before it could be built, the library was destroyed with other parts of the Capitol building. Ultimately, Thomas Jefferson donated his personal book collection to replace the destroyed library and a permanent building was eventually completed in 1897. 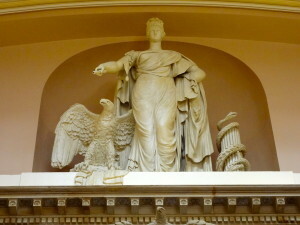 (For more information on the Library of Congress, please click on the first of the three part series. Meanwhile, since the number of US senators and representatives was increasing with the expanding size of the United States additional extensions were planned for both the north and south wings of the Capitol. With these proposed renovations the height of the dome would appear out of proportion and plans were made to alter the size of the dome. In 1856, the old dome was removed and work began on an updated replacement dome made of cast-iron that would be fireproof. 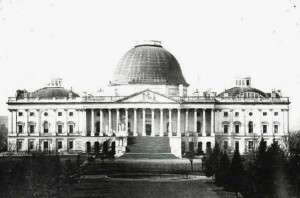 Then, with the onset of the Civil War in 1861, construction work on the Capitol extensions and dome were suspended while the building was used for military barracks and a hospital. But a year later, President Lincoln firmly believed that the Union would ultimately survive and the construction on the Capitol resumed and were completed in 1868 after the end of the war. Over the following years, the Capitol building was periodically renovated and both the East and West Fronts were expanded, terraces were constructed and the surrounding grounds were landscaped by the famous Frederick Law Olmsted. 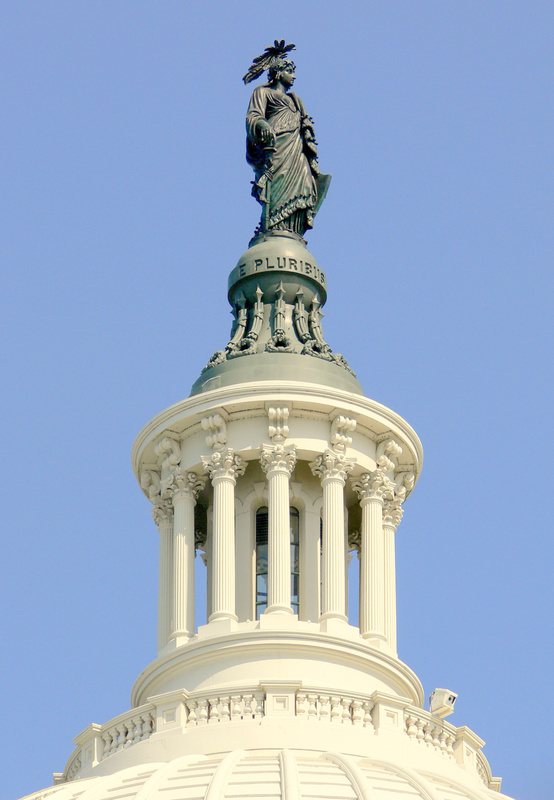 The Capitol measures 751 feet 4 inches in length from north to south, the width measure 350 feet in length and the height from the base of the east front to the top of the Statue of Freedom measures 288 feet. 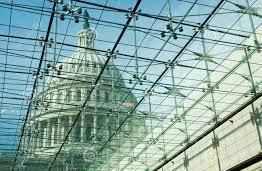 There are six Congressional office buildings constructed in the immediate surrounding area which make up the Capitol extended complex on the appropriately named Capitol Hill. As of 2014, a major restoration project was started on the Capitol dome and a massive scaffolding was erected, it is scheduled for completion in 2017. Visitors to the U.S. Capitol start their tours at the Capitol Visitor Center located in the area at the East Front of the Capitol. The Visitor Center opened in December 2008 and it is an underground 580,000 square foot facility where all visitors are processed through a strict security checkpoint. While visitors are waiting for their tours to start there are exhibits and displays, including a 10 foot model of the Capitol Dome, and an interesting view from overhead windows. 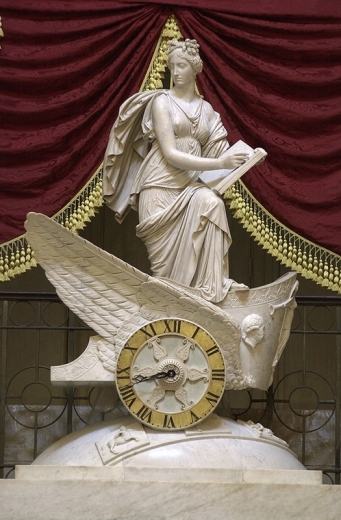 Also located in the Visitor Center Emancipation Hall is a plaster model of the Statue of Freedom which seats on the top of the Capitol Dome. Before starting the tour of the Capitol, visitors will see a 13 minute film about the history of the U.S. Capitol and Congress. 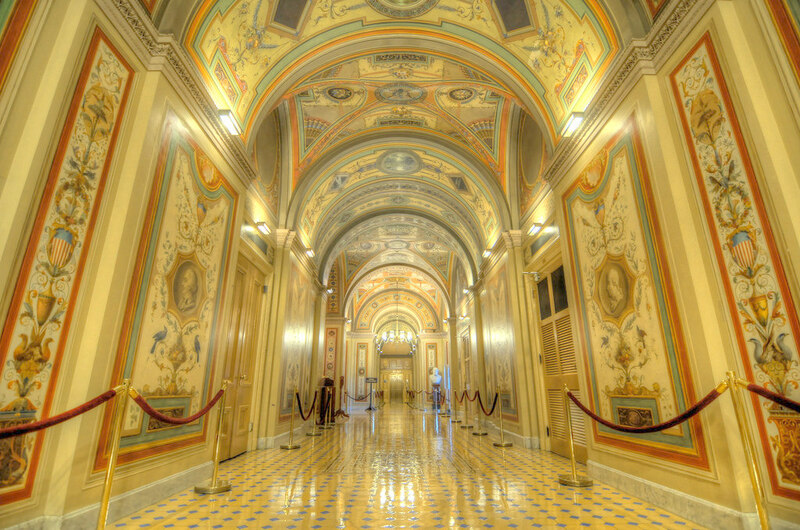 The 450 seat Congressional theater as the Capitols venue for full-media governmental screenings and was designed for the joint session of Congress and special Library of Congress presentations. Tours are available for free and tickets can be acquired in one of two ways. Limited tickets are available at kiosks on the East and West Fronts of the Capitol or at the Information Desk at the Visitor Center. Visitors can also book tickets in advance at www.visitthecapitol.gov or by contacting their local House of Representative or State Senator’s office or by phone at (202) 226-8000. 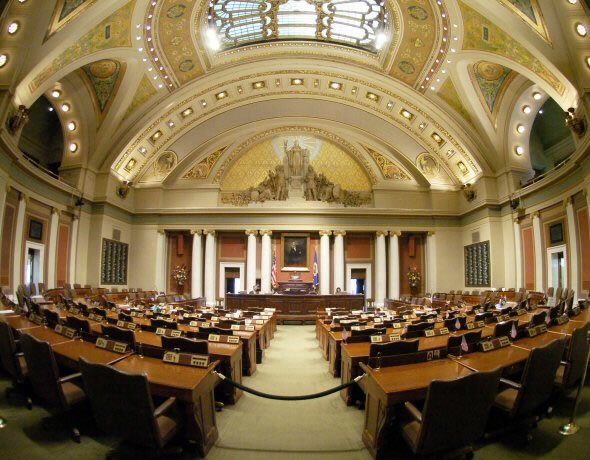 To watch Congress in Session, visitors can request House or Senate Gallery tickets through their Representative or Senator’s office. 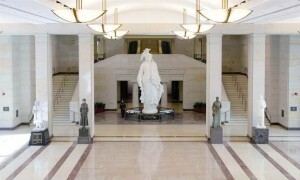 The United States Capitol was built in a distinctive neoclassical style with a white exterior; the east front has an extended terrace which is the official reception area for dignitaries and visitors. The Capitol is considered the center of Washington, D.C. and from the Rotunda the Senate chambers are to the north and the House of Representative chambers are to the south. At the East Front of the Capitol are the 17 foot tall bronze doors known as the Columbus Doors. 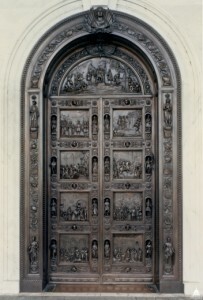 The doors depict Christopher Columbus and his journey in discovering America; the doors were designed by Randolph Rogers and were cast in Munich in 1860. The House of Representatives Chamber is the largest room in the Capitol and is located in the south wing where both the House and the Senate hold joint meetings. 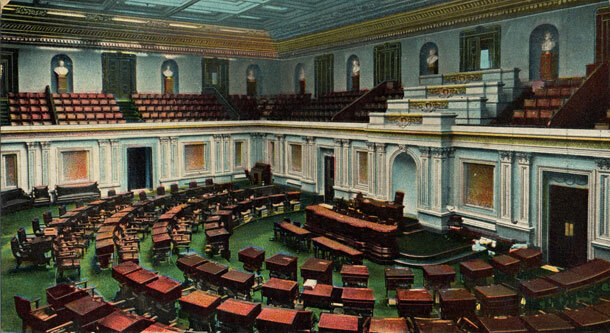 Most visitors will recognize this room from the televised Presidential State of the Union addresses with the President standing at the podium on the raised dais, the Vice President seated behind on the left and the Speaker of the House seated on the right, the Chamber has 448 permanent seats arranged in a semicircle facing the Speaker’s rostrum and there is an upper gallery which surrounds the room and is where visitors and the press sit. The Chamber has a Daniel Webster quote etched in the marble surrounding the walls, there are also twenty-three relief portraits of famous lawmakers throughout history. 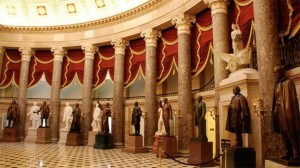 The National Statuary Hall is located in the south wing of the Capitol and was the original House Chamber. 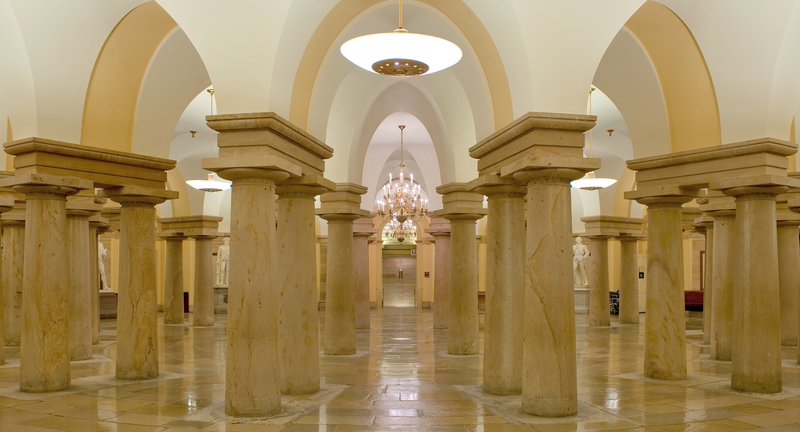 Around the perimeter of the semicircular high-ceiling room are several large Breccia marble columns, quarried from the nearby Potomac River, and each is topped with white marble Corinthian capitals which were carved in Italy. In a niche above the colonnade is an Enrico Causici plaster statue, Liberty and the Eagle and in the frieze below that is an eagle sandstone relief figurine. Above the door leading into the Capitol Rotunda is a large marble sculpture which depicts Clio riding the chariot of Time with the wheel of the chariot containing the Chamber’s clock. In 1976, the National Statuary Hall underwent an extensive restoration in preparation for the Nation’s bicentennial celebrations. Based on the 1822 Smauel F.B. Morse painting, The House of Representatives which currently hangs in the nearby Cororan Gallery of Art, the room received new reproduction chandeliers, sconces and deep red draperies. Bronze markers were placed on the black and white marble patterned floor marking the locations were former presidents sat when they served in the House. 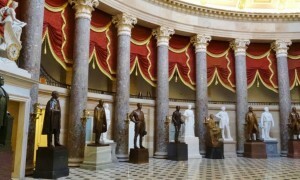 The highlights of the room are the numerous statues which were originally donated by each of the fifty states which initially submitted two statues to honor their notable historical citizens. 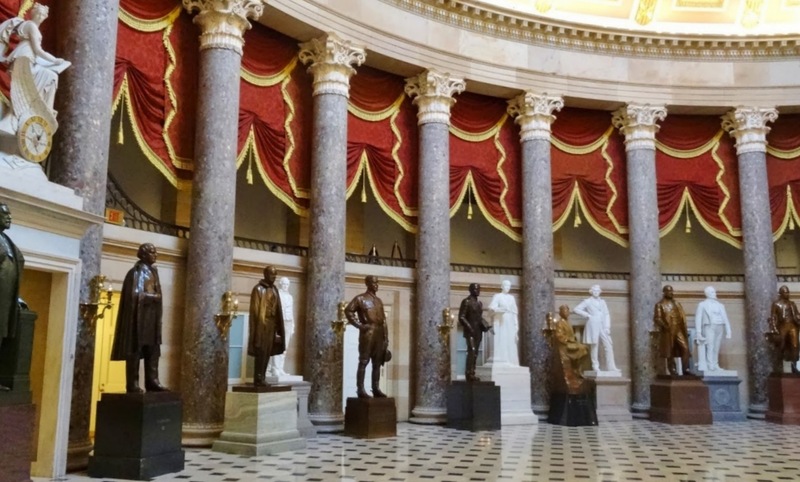 Throughout the years, additional statues were added to the collection and ultimately Congress authorized that the statues could be displayed in other areas of the Capitol, such as the Emancipation Hall and the Hall of Columns. Recently two more statues joined the collection; the statue of former President Ronald Reagan in 2009 which sits in the Capitol Rotunda and the Rosa Parks statue in February 2013 which sits in the National Statuary Hall. Special Note: The King Kamehameha I statue was donated by the state of Hawaii; it is the largest statue in the collection. The bronze statue is 9.5” tall and placed on a 4.5”granite base, the combined weight of both is approximately 15,000 pounds. The Rotunda is situated in the center of the Capitol building, the circular room measures 96 feet in diameter and soars to a height of 180 feet from the floor to the interior of the dome. 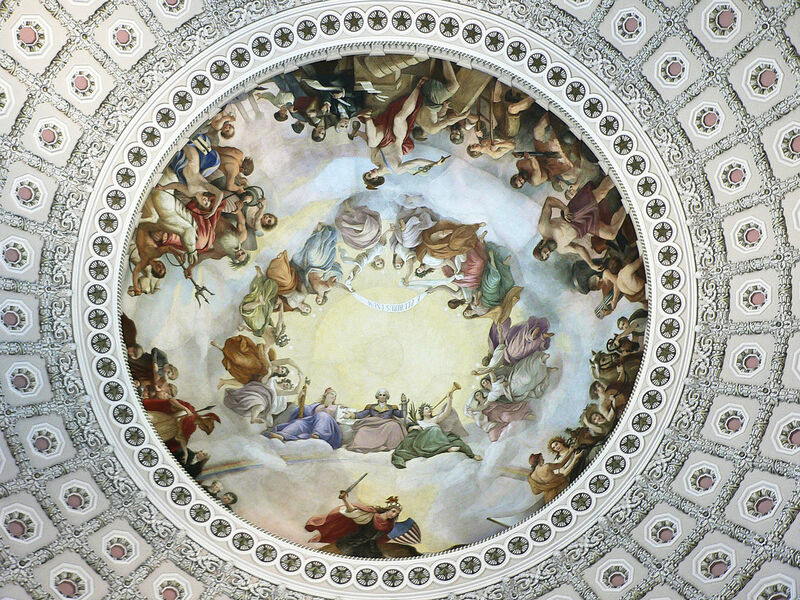 The interior dome features the “Apotheosis of Washington” mural painted by Brumidi. The first President of the United States is depicted as a seemingly Roman or Greek god ascending to the heavens surrounded by 13 goddesses. 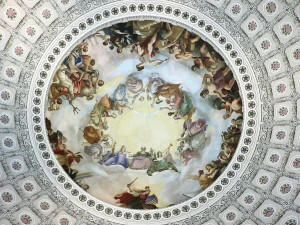 At the base of the dome is a frieze depicting the history of United States arranged in chronological order, such as Christopher Columbus “discovering” America, the Pilgrims, Pocahontas and the first flight the Wright Brothers. 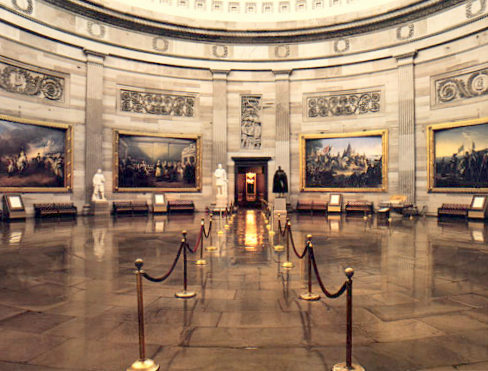 In the Rotunda there are also several notable paintings, on the west side is the “Declaration of Independence”, the “Surrender of Lord Cornwallis”, and the “George Washington Resigning His Commission”. The “First Reading of the Emancipation Proclamation by President Lincoln” hangs over the west staircase leading to the Senate wing. The Rotunda is also the location where eleven former Presidents, several Senators and Supreme Court Justices have been granted the highest honor to be laid in state, the last president to lay in state was Gerald Ford in 2006. Exceptions have been made and with Congressional approval citizens such as Rosa Park was allow the privilege in October 2005. 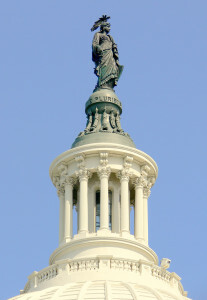 The Capitol Dome is located on the exterior of the Rotunda with the Statue of Freedom set on top. The Dome was constructed between 1855 and 1866 and although it appears to be made of stone it is made of 8,909,200 pounds of cast iron and painted to match the stone of the building. The architect of the Dome, Thomas Walter, based his design on several other famous domes, St. Peter’s Basilica in Rome and St. Paul’s Cathedral in London. The Dome is constructed as two structures, the exterior dome which rises to the height of 288 feet and the interior dome which measures 180 feet from the Rotunda floor, as shown in the drawing below. Through the years, the Capitol Dome has undergone several restorations; the most recent is an extensive restoration which started with scaffolding being erected around the Dome in November 2014. The project will involve both interior work to the Rotunda and the exterior of the Dome to repair the iron structure, repainting the exterior Dome and the installation of new lighting. The restoration is schedule to be completed and the scaffolding removed in time for the 2017 presidential inauguration. 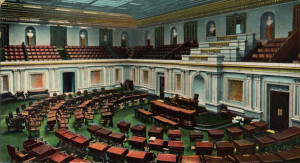 The Old Senate Chamber was used by the U.S. Senate from 1819 until 1859 when the larger Senate Chamber was built as part of the Capitol extension and then the room was used by the U.S. Supreme Court from 1860 until 1935 when the Supreme Court Building was built nearby on Capitol Hill. Today, the 75 foot diameter semi-circular room is used as a museum. 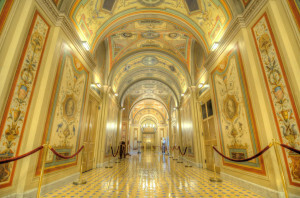 Located on the first floor of the north wing of the Capitol is the beautiful vaulted Brumidi Corridors. Constantino Brumidi designed the elaborately decorated hallways with murals depicting various people and events in the history of the United States; such as Benjamin Franklin and the Cession of Louisiana. The walls are beautifully painted with animals, insects, plants and flowers indigenous to the United States. Later, additional moments in US history have been added; such as the voyage of the Spirit of St. Louis, the Moon landing by Apollo 11 and the crew of the “Challenger” Space Shuttle. Located on the basement floor directly under the Rotunda is the Crypt. This area of the Capitol was originally intended to be the final resting place of the first President of the United State, George Washington, but according to his wishes as stipulated in his will be is buried at Mount Vernon. The West Front of the Capitol is located facing the Mall area of Washington D.C., the Lincoln Memorial is located at the opposite end of the Mall. 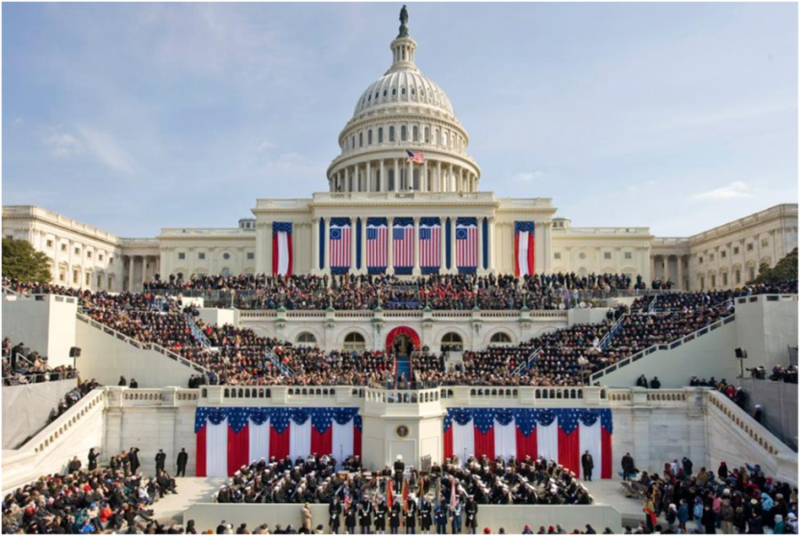 The West Front has become the location of the presidential inaugurations which is traditionally held every four years on January 20 (or the 21st if the 20th is a Sunday). 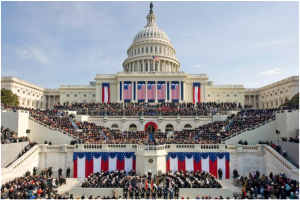 The first inauguration ceremony to take place at the West Front of the Capitol was the 1981 inauguration of Ronald Reagan; his second term inauguration took place the Rotunda of the Capitol due to cold weather. 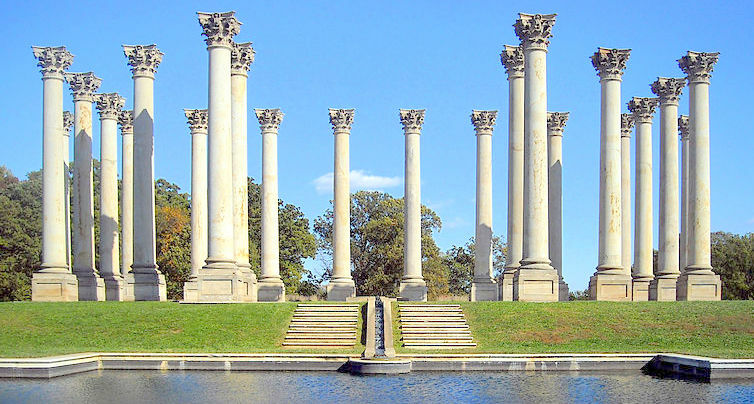 The National Capitol Columns were originally used at the old East Portico and removed during the Capitol expansion in 1958, the old quarry identification marks are still on some of the columns. 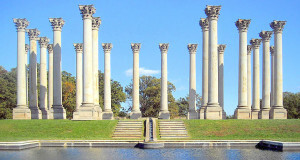 Twenty-two of the original 24 Capitol Columns were relocated to the National Arboretum and placed in the Ellipse Meadow 1984 (the other two columns were placed at the top of Mount Hamilton, both were damaged and had neither a base or a capitol). The stone foundation for the Columns was originally used as the steps on the east side of the Capitol with flowing water that runs down a channel into a small reflecting pool. The US Capitol has a private subway station; it was built in 1909 to link the Russell Senate Office Building to the Capitol and requires a Capitol staff ID. 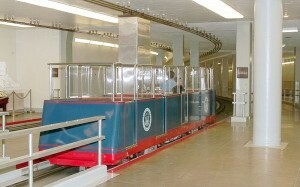 An additional subway line takes the Senators, Representatives and Capitol staff to the Hart and Dirksen buildings. The Congressional Chapel was opened in the Capitol in 1955 and is located near the Rotunda, it is available for the use of members of Congress who seek a quiet place for meditation or prayer and not open to visitors. 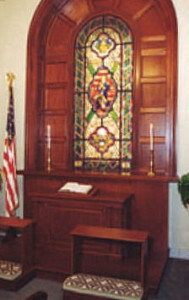 The Chapel is a non-partisan design so that it could be used by any Senator or Representative regardless of his or her faith. The room’s main feature is a stained glass window of President George Washington kneeling in prayer, with the words from Psalm 16:1, “Preserve me, O God, for in thee do I put my trust,” and also included are the words, “This Nation under God”, from President Abraham Lincoln’s Gettysburg Address. Back in 1859, most of the members of Congress lived in boarding houses with no running water, so the decision was made to install several bathtubs as well as a barbershop. 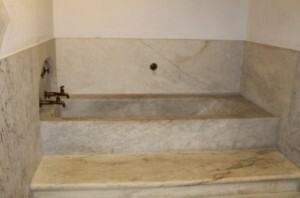 The bathtubs were carved from a single piece of marble and shipped from Italy. After the installation of modern plumbing throughout Washington, the bathtubs were no longer needed or used and currently the water supply has been cut off. At any given time, several United States flags fly over the Capitol building and the flags have been flown continuously day and night since World War I. Two flagpoles are located at the base of the Capitol Dome on both the East and the West sides. Two other flagpoles are located above the North Wing (the Senate side) and the South Wing (the House side) and are flown only when the Congress is in session. There are also several additional flagpoles located west of the Dome and are not visible from the ground, these flagpoles are used to meet the congressional requests for flags flown over the Capitol. 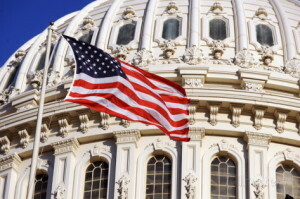 Special Note: U.S. flags flown over the Capitol can be order through your local Congress member to commemorate specific events, such as the death of a veteran. Personal Note: When we visited in Washington D.C. in 2002 we ordered a flag flown on the day we would be visiting the U.S. Capitol, it makes a wonderful and relatively inexpensive souvenir!